This is one turkey you won’t want to eat. 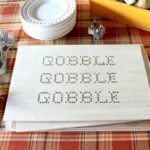 We’re making turkey napkin rings for Thanksgiving using basic craft supplies, so easy and simple you’ll want a whole flock. 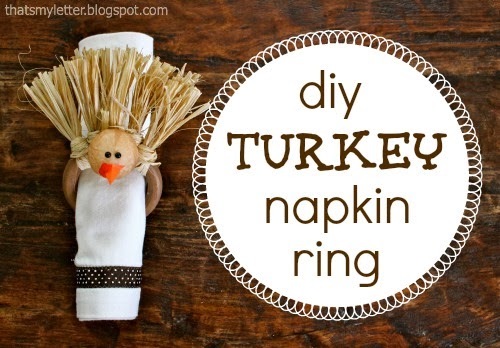 A DIY tutorial to make turkey napkin rings using curtain hardware. 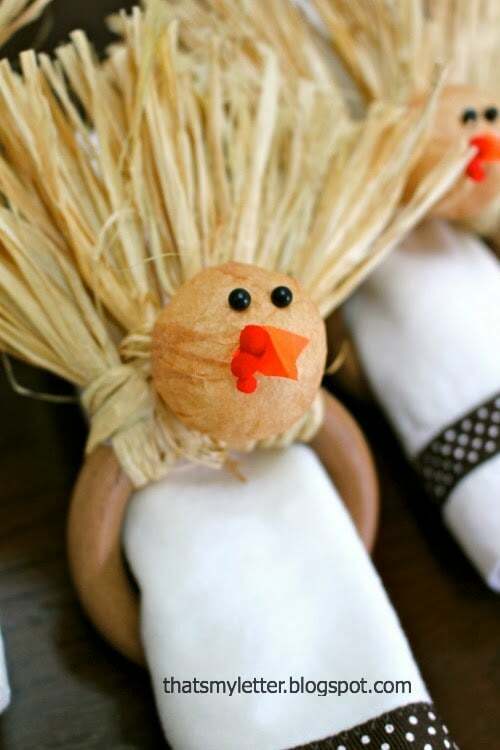 Add a texture and a touch of charm to your Thanksgiving table with this turkey. 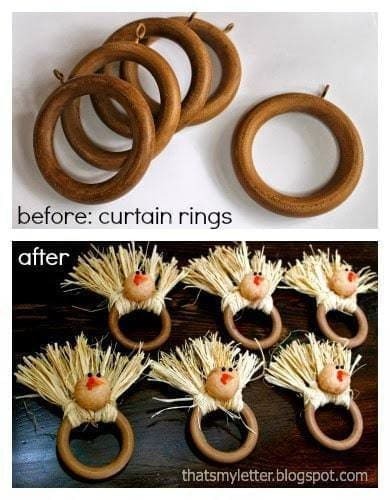 I had taken down some old curtains and was left with a bunch of curtain rings. A great repurpose idea these wooden curtain rings make perfect napkin rings for your table place settings. 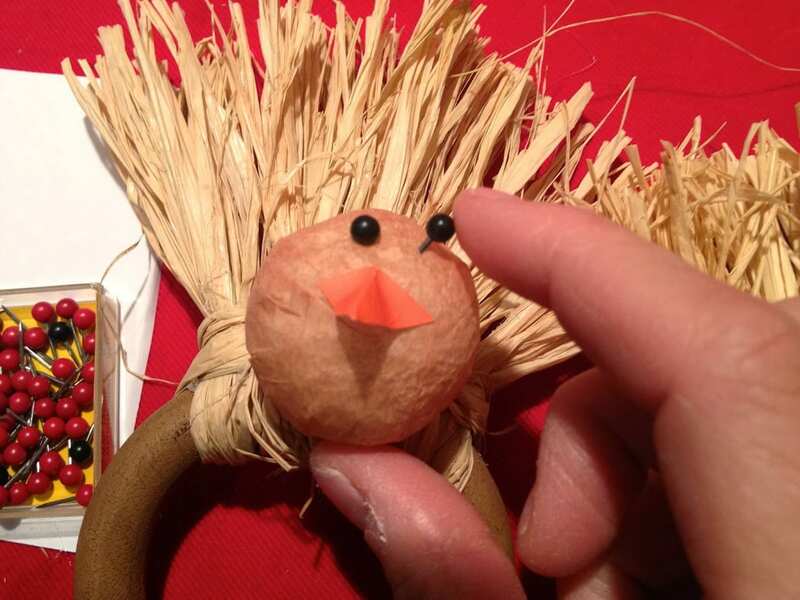 The feathers made from regular raffia add tons of texture and the turkey head is a small styrofoam ball wrapped in light brown tissue. I added short black straight pins for eyes, an orange card stock beak and tiny red pom poms for the snood. When we moved into our new home I took down the existing curtain rods and rings in the family room and saved them in my stockpile of weird parts. Who knew they would make perfect turkeys? 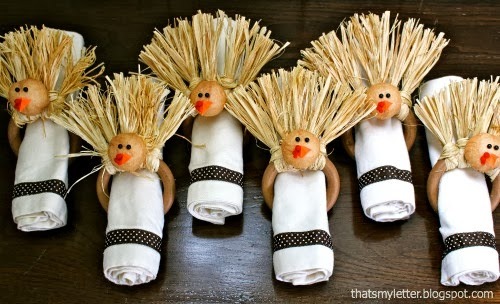 These turkey napkin rings add tons of dimension and make a fun addition to your Thanksgiving table setting. 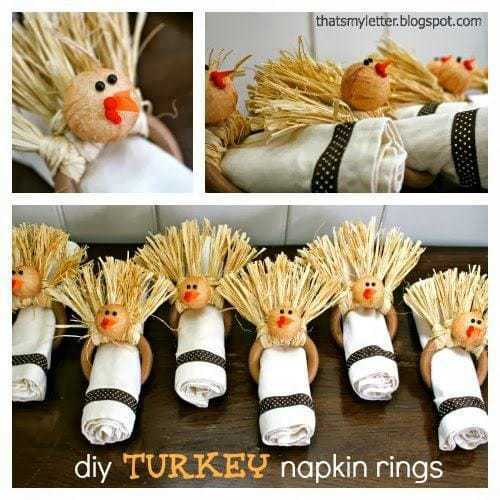 Below are the step by step instructions to make turkey napkin rings. Use what you have on hand and make it easy and inexpensive. 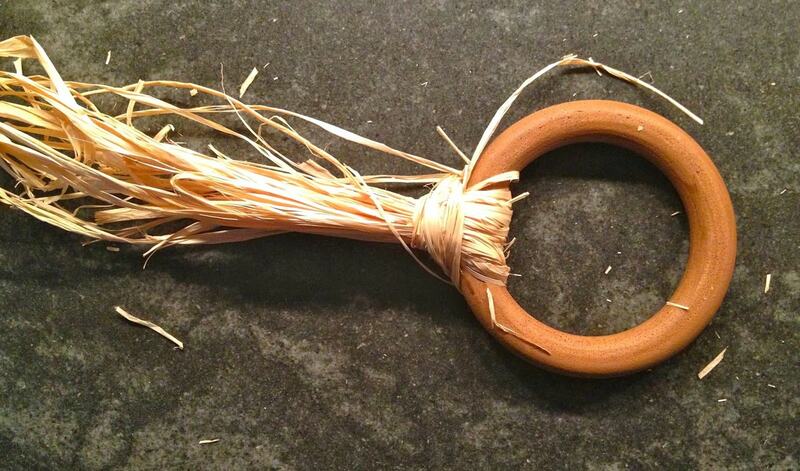 Step 1: Start with a wooden or brownish curtain ring. 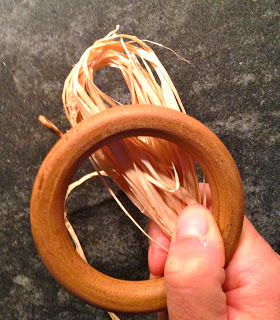 Cut 10 pieces of raffia about 12″ long. 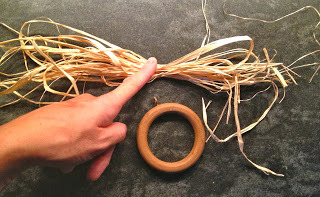 Step 2: Fold raffia pieces in half and keep fold behind and above ring. 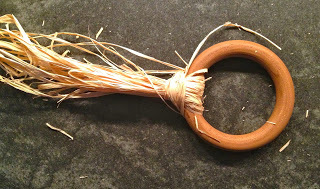 Step 3: Pull loose ends of raffia through folded loop end in the middle of the curtain ring. 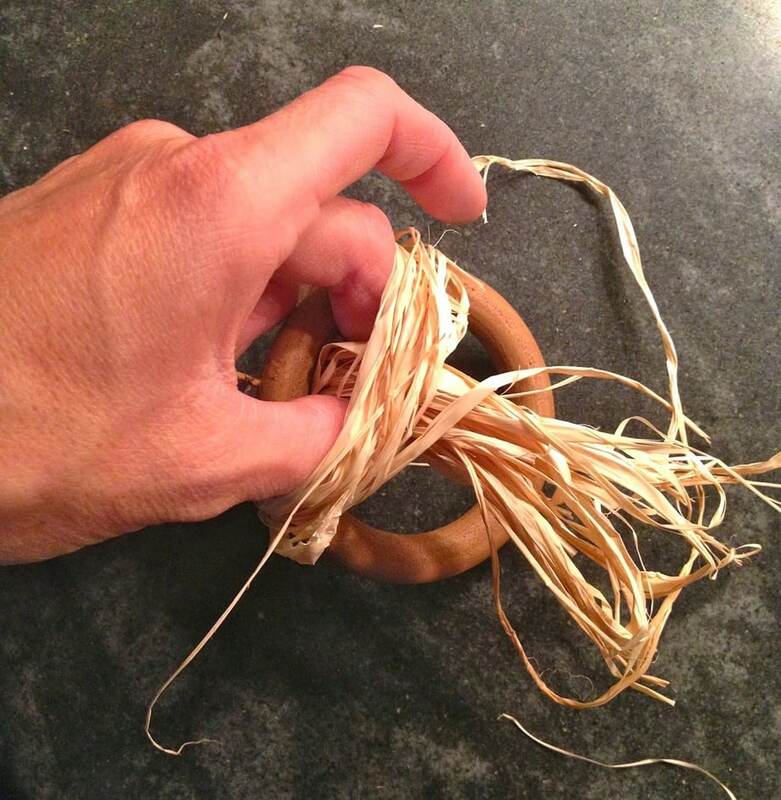 Use the hook on the curtain ring as your center point (covering it with the raffia) and pull tight. 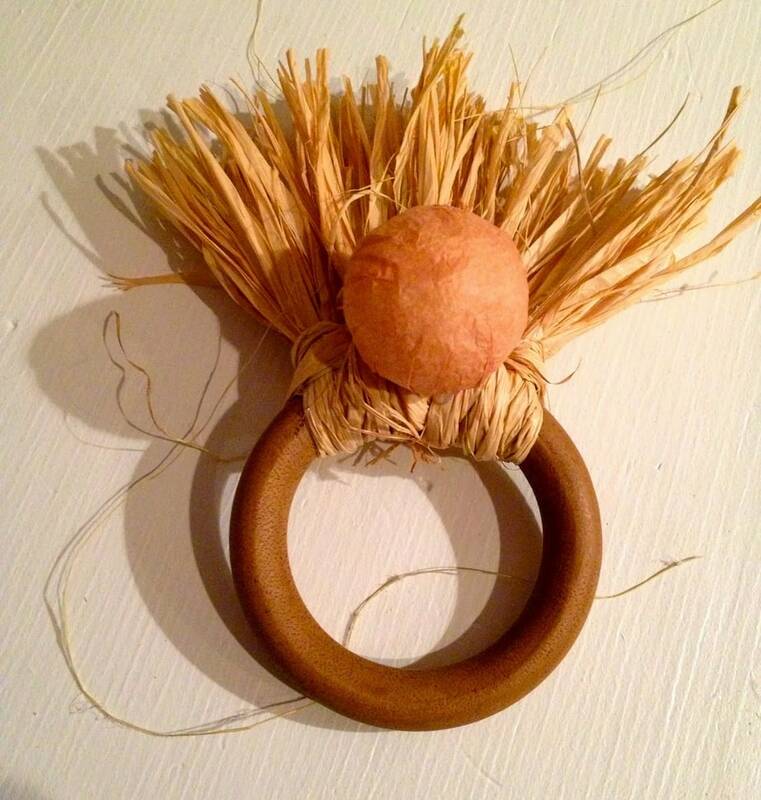 Don’t worry about the length of the raffia, you can trim it later once all the pieces have been added. Step 4: Add two more raffia groups on either side of center. 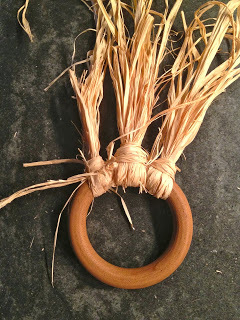 To keep the pieces from shifting add a dab of hot glue on the ring (under the raffia knot). 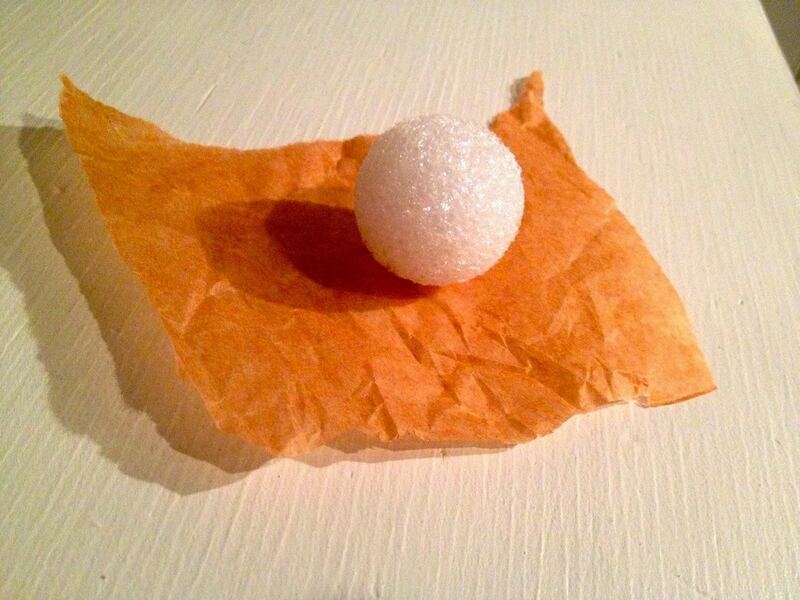 Step 5: To make the turkey head take a small piece of tissue paper and cover the styrofoam ball. Step 6: Hot glue the turkey head at center in front of raffia feathers. 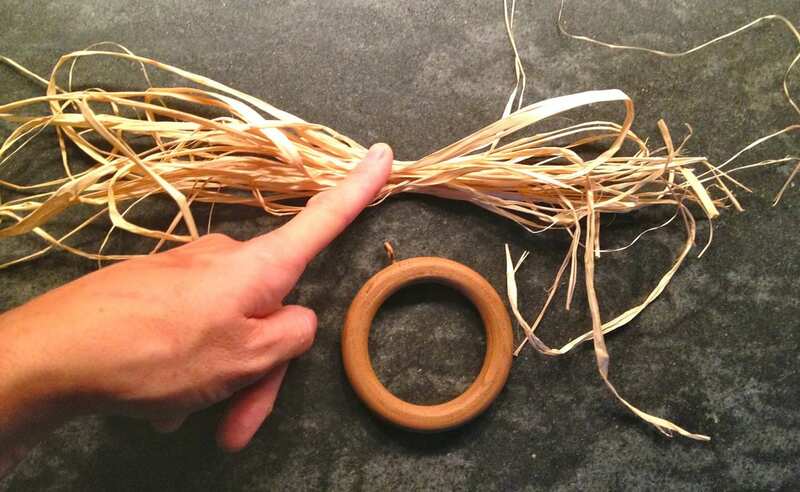 Now trim the raffia into an arched shape. Step 7: Add short black straight pins for eyes and hot glue a triangle piece of orange cardstock for the beak. Finally add tiny red pom poms down one side of the beak for the snood. 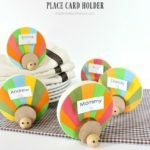 so cute and i think the kids could do this! These are absolutely adorable! 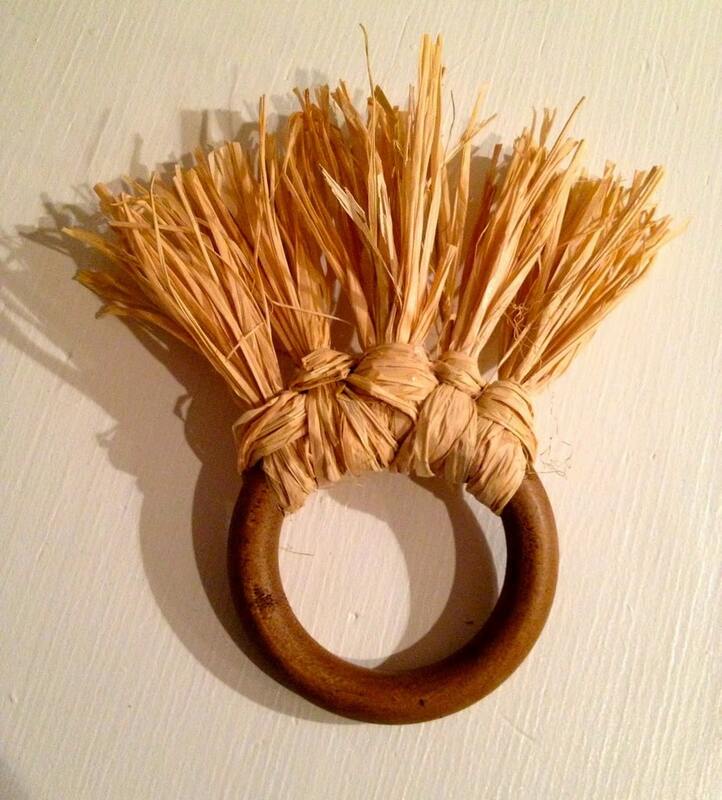 You are so creative Jamie! Pinned them! So creative! So cute! So inspiring! Hello! These are adorable and I will be making them for Thanksgiving this year! Do you, by any chance, know how big (or small) your curtain rings were? 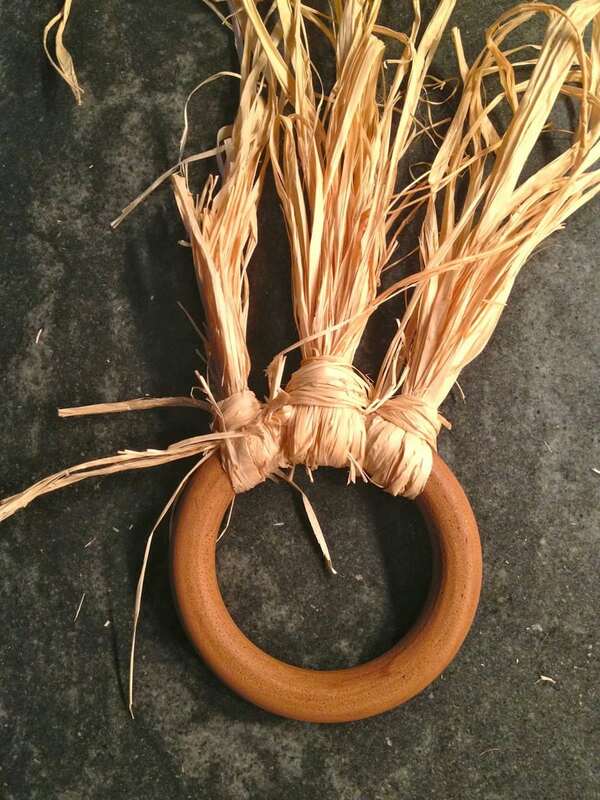 I got 1 1/4in (the only wooden ones I could find) but they look a little big for a napkin ring. 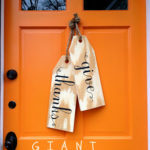 Again these are adorable and you are so creative!! Thanks for the great tutorial.